While most of us struggle to even put furniture together, Spanish hacker and father Jose Julio is building entire robots out of spare parts. The hacker evidently decided one day that he wanted to build a robotic air hockey table for his daughter, who loved the game. While most people would probably shrug the idea off as essentially unworkable, Julio simply went out and did it. Have I mentioned he's a bit of a robotics nut? 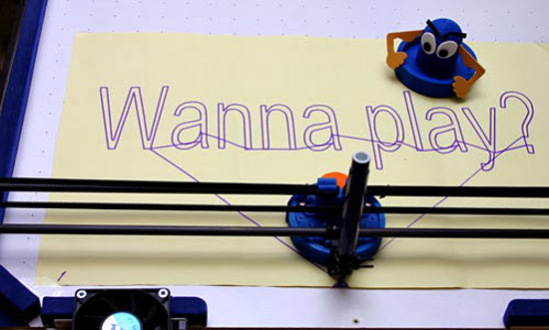 "My daughter loves the air hockey game and I love robotics so one day an idea [was] born in my mind. Can I construct?" Julio wrote on his blog. "It seemed very complicated and with many unresolved questions (puck detection? robot speed? ), but that's part of the fun." With a design already in mind, Julio put together his own air hockey table, with two PC fans providing the cushions of air required to move the puck. Naturally, that was only step one - after all, it's not like it's hard to find a working air hockey table; there's not much point to building one. Well...unless you're planning to basically turn it into a robot. Using his family's RepRap 3D printer, Julio created his own brackets, puck, and paddle, at which point he dismantled the machine (I'm assuming his wife had some words with him for that) and pulled out the stepper motors, drivers, belts, bearings, and rods. All of these were to go into his new robot. "After several design iterations of the pieces, and some material changes to minimize the weight and inertia (and thus increase the accelerations of the robot) I got a fairly operational design," he explained. Now that he'd created the robot, the next step was teaching it to play Air Hockey. That proved a little bit more challenging, but eventually, Julio tossed together a solution, equipping the 'bot with a PS3 EYE camera. Using said camera, the robot tracks the puck's expected position and trajectory to determine how best to block it. Of course..there's just one small problem. His daughter's not exactly going to be capable of going toe-to-toe with Julio's invention, as according to him, the robot can now easily beat a child. Oops. "An adult with some experience can still [defeat] the robot, but I am sure that with some more small improvements it is going to be really hard to beat," he added. In the future, he feels as though the robot's got a lot of potential outside of just being a gift for his daughter; robot-vs.-robot air hockey competitions could very easily become a thing. 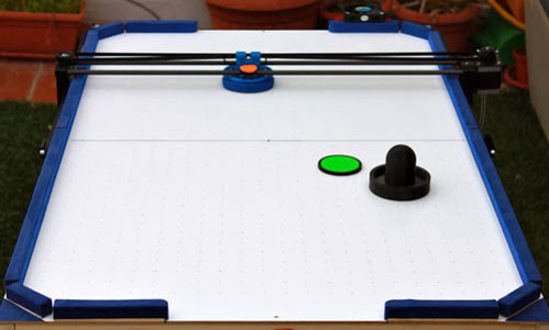 This air hockey table is far from Julio's first project - last fall, he used the same 3D printer he dismantled for the table to create B-Robot, a little machine that can be either wander about on its own using on-board sensors or be controlled using a mobile device. This table probably won't be his last project, either - I'd imagine he's got a whole host of robots in mind to build for his daughter as she grows up. Mad scientists make the best dads.